Rather roof when it is 100°? We understand construction and contractors and we also know you would probably rather roof when it's 100° than think about marketing or advertising for your construction business. We design a comprehensive program so marketing becomes as easy and automatic as using your tape measure no matter what the weather. 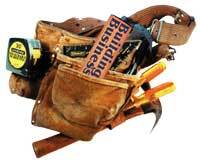 establishes you as an experienced building professional providing valuable services that improve people's lives. Together, we define your construction business, your customers, (current, past and potential), your style and skills, and the most profitable focus for your business future. We can build your plan from bare ground or just do a little remodeling or addition...whatever you need within your budget. Just like you, we can work on a defined project bid or by time and materials. We coach until your marketing training becomes marketing habits. We are here to answer all those to do, not to do, and how to do questions about home shows, trade shows, advertising, donations, sponsorships, memberships and networking. We help you work smarter, not harder. Of course you could be another do-it-yourselfer but your customers hire a skilled building professional, (you), with the experience, tools and skills to do the job on time, on budget, and right, the first time, shouldn't you? and, of course, WE DELIVER!